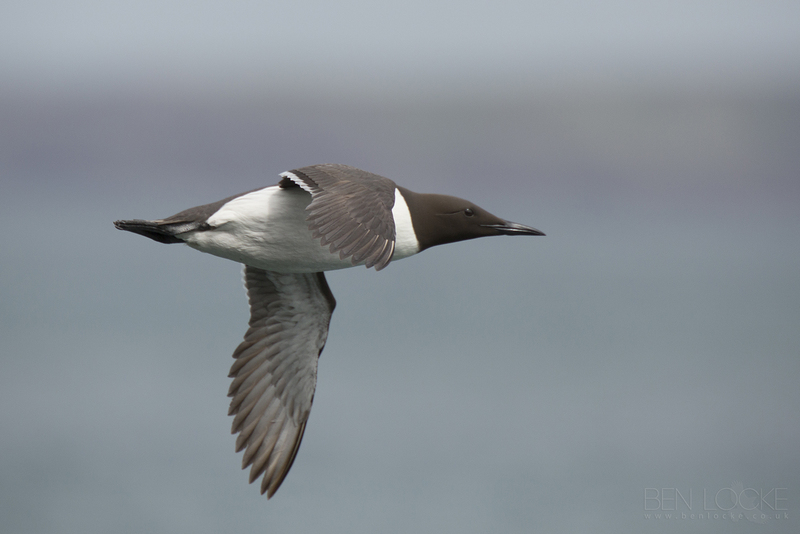 This Common Guillemot was photographed on the Pembrokeshire coast. With a flight speed of 80kmph they're pretty fast, but not especially agile. The Guillemot has perhaps the smallest nesting territory of any British bird, extending a beak length round its nest (about 5cm) and its egg is so shaped as to roll in circles, rather than off the narrow cliff edge on which it is laid. It's a pursuit-diver that forages for food by swimming underwater using its wings for propulsion. Dives usually last less than one minute, but the bird swims underwater for distances of over 30m on a regular basis. Diving depths up to 180m have been recorded.